An hour-long special on "Hercules" and "Xena" is scheduled to air at 11:00�am and 9:00�pm (PST). Announcing the official Hercules & Xena CD-ROM!! For all you Heroes and Amazons who just can't get enough of Hercules & Xena, take a look at the official Hercules & Xena CD-ROM: The Heroic Legends of Hercules & Xena from Software Sculptors. This definitive Hercules & Xena CD-ROM contains complete episode guides, mythical monsters, star backgrounds, never before seen bloopers, special effects wizards secrets, beautiful hard bodies, screensavers and more!!! 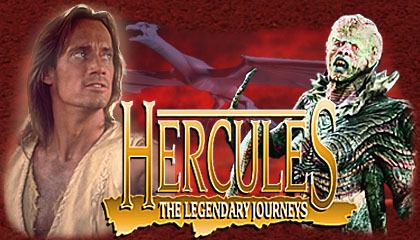 MCA Televsion congratulates the winners of the Hercules: The Legendary Journeys Make Me a Monster Sweepstakes! By popular demand: The Joe LoDuca Profile! As the composer for Hercules and Xena, Joe�answers your NetForum questions and provides the ultimate insider's perspective into the making of the incredible Herc and Xena music. Experience the myth and the legend. Here is Storytime , the guide to the adventures of the half-man, half-god, vulnerable but heroic son of Zeus. Catch a glimpse or two of some of the amazing bodies (and we're not talking water here!) Hercules encounters in his far travels. Journey back to the fabled Babes and Studs Land of yore! Lost kingdoms and sunken cities, eat your hearts out . . . It's no Herculean effort to find others to discuss your favorite show with when you've got the Hercules NetForum right here . . .
Are we sexist to call an area Hercules In Babe-Land? We dare anyone to say that, when we have a star like Kevin Sorbo. Come peruse the gallery of ladies we pair-off against him. What makes the series hot? Other than the hard bodies (see, we know why you watch the show) it's the creatures. Check out the Creature Factory, for photos, interviews and step-by-step production notes. For a Who's Who among the Olympian elite, Mythology 101 is a refresher for the mythologically-impaired. A scorecard for the gods and goddesses (and no, we don't mean the women on Baywatch) -- these are not quite the bedtime stories they taught you in school. The Herc Virtual Gallery is unlike any other photo gallery we've seen. Think back to the great 3D B-movies of the 50's and 60's; now think monsters that jump off the screen. Grab your stereoscopic glasses and see what we've made jump.